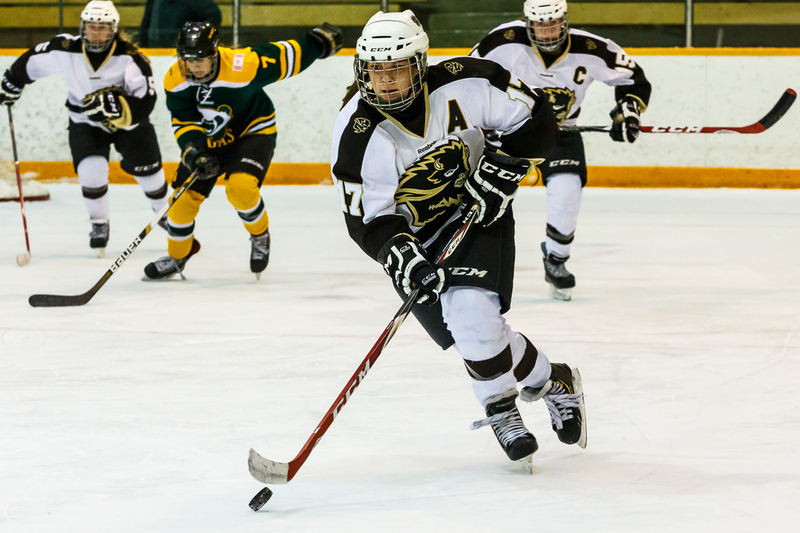 The University of Manitoba Bisons women’s hockey team couldn’t manage to break free of a three-game losing skid heading into Friday’s matchup at Wayne Fleming Arena against the Saskatchewan Huskies – falling 3-1 to the visitors. Looking to take advantage of an increasingly goal-desperate Bisons team, the Huskies drew first blood just before the midway point of the first period. Shyan Elias managed her first goal of the season, finishing off a scramble in front of Rachel Dyck’s net. A minute and a half later, the Huskies doubled their lead when Lauren Zary potted her seventh of the season. The Huskies were able to make good on their few chances of the second period. Brooklyn Haubrich weaved possession toward the Bisons goal and beat Dyck for a commanding 3-0 lead after 40 minutes. Meanwhile, the Bisons managed to outshoot the Huskies 13-8 after two frames, but were yet to be rewarded. Saskatchewan goaltender Cassidy Hendricks was square to the Bisons on every attempt on goal heading into the second intermission. Manitoba began to inflict heavy pressure on Saskatchewan in the third period, outshooting the opposition 10-1. Yet, like so many times already this season, the Bisons found their energy too late in the game. Alanna Sharman stopped Hendrick’s bid for a shutout, however Manitoba ultimately dropped the contest. The Herd can take a positive note from an otherwise unsatisfactory performance, having held their opponents to under ten shots. Hendricks made 22 saves for the victory, while Dyck made just six saves on nine shots in the defeat.